Directions to this Site: If you are coming from the east (say Halifax), take exit 17E from Highway 101 and turn left or south on Maple Street. 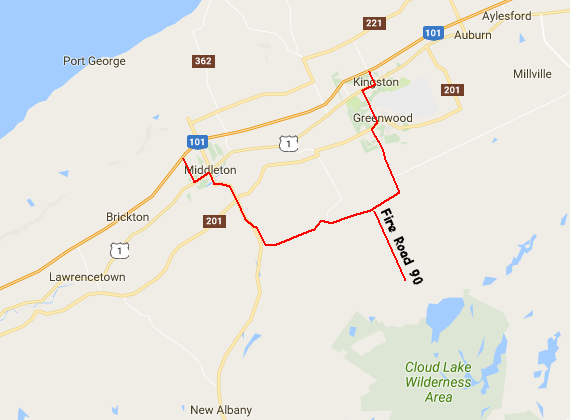 Travel 0.9 km SSE to Main Street (Highway 1) and turn right or WSW on it. Follow Main Street 1.0 km to Bridge Street, Kingston and turn left or SSE onto it. Follow Bridge Street 2.2 km to Central Avenue (Highway 201) and turn right or WSW on it. Proceed 0.5 km to the Tremont Mountain Road. Turn left or SSE on it and drive 4.4 km up to the East Torbrook Road. Turn right or WSW on it and go 2.7 km to Fire Road 90, on the left or south side. If you are coming from the west (say Yarmouth), take exit 18 from Highway 101. Turn right or SSE onto Brooklyn Road and proceed 1.6 km to Highway 1 (Main Street). Turn left or ENE on Highway 1 (Main Street) and go 1.2 km to Bridge Street or Highway 10. Turn right onto it and proceed SSE 4.6 km to Nictaux Falls Road. Turn left onto it and proceed SE 500 metres to Torbrook Road. Take the left fork onto Torbrook Road and go 5.3 km (SE at first, then ENE) to the East Torbrook Road. Go straight onto it, rather than turning left to continue on Torbrook Road. Follow the East Torbrook Road a total of 2.4 km (SE at first up onto the South Mountain, then ENE) to Fire Road 90, on the right or south side. 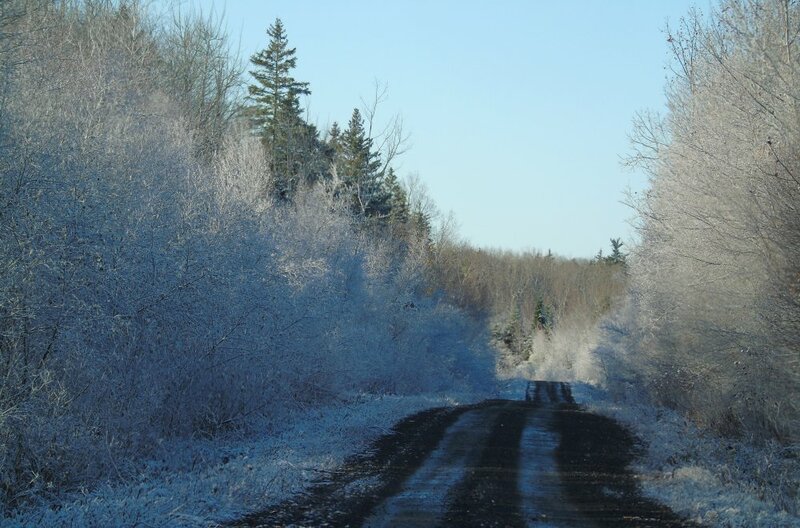 Site Description and Birding Information: This sometimes rough gravel road is an excellent introduction to the "South Woods" accessible from the Annapolis Valley. It is sometimes impassible for vehicles without chains because of ice on the steep hills in winter. Even then the first few kilometres are usally drivable. There are many potholes, so watching for birds is best done when stopped. Along this road there are many clear cuts. Many logging roads go off on either side. After going south for some time it then turns east and eventually reaches Cloud Lake. 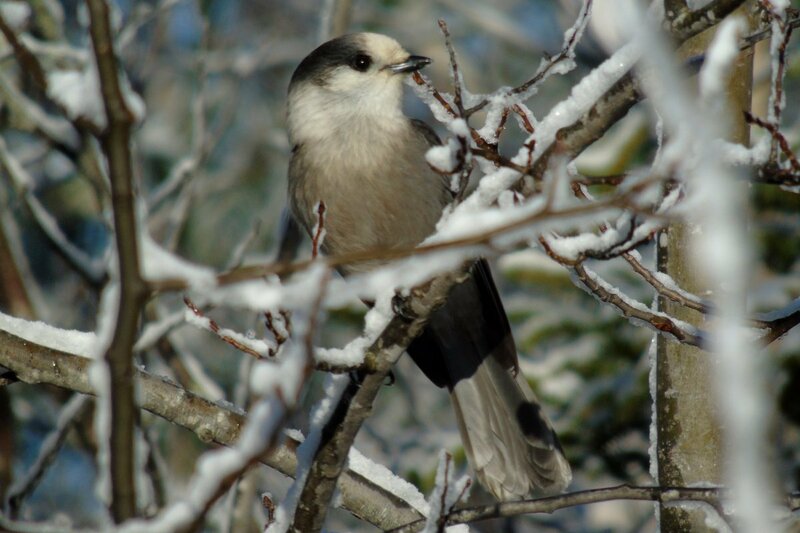 One of the main attractions here birdwise is the access to habitat where winter finches and Gray Jays can be found with relative ease. A good area for Gray Jay is a sand quarry at about the 5 km mark. Return to Birding Annapolis Valley's Annapolis Valley Birding Site Map.